The Sickle Cell Association invites you to the 7th Annual SICKLE CELL STROLL on Saturday, September 8, 2018. TIME: Registration/Check In begins at 9:00 A.M. and Stroll begins at 11 A.M.
*Showing your team spirit! Organize a team of friends, family or co-workers. *Spread the word! September is Sickle Cell Awareness Month. The Sickle Cell Stroll is a great way to get educated about the disease, learn about the importance of being tested for the trait and join the bone marrow registry to save a life. Everyone is encouraged to wear the 2018 Stroll T-shirt to help show that we are Together Against Sickle Cell Disease! Register at half price for a limited time. Start your team and register TODAY! Calling All Teams: Represent your team with your own look. Create a team and compete for best poster, the most funds raised and best team spirit/pride. Please note that everyone is encouraged to wear the 2018 Stroll t-shirt to support the theme Together Against Sickle Cell Disease! Registration open to the public. Register with a $20 donation ($10 for children) to reserve your Stroll t-shirt. T-shirts will be available in advance of Stroll for an opportunity to personalize it. Register By Mail: Mail registration and donation should be mailed by August 25, 2018. Register at the Stroll: Registration will be available at the event; however t-shirts are available only while supplies last. Please use credit/debit, check or money order for any donations made on site. For details about Vendor Opportunities, click here. 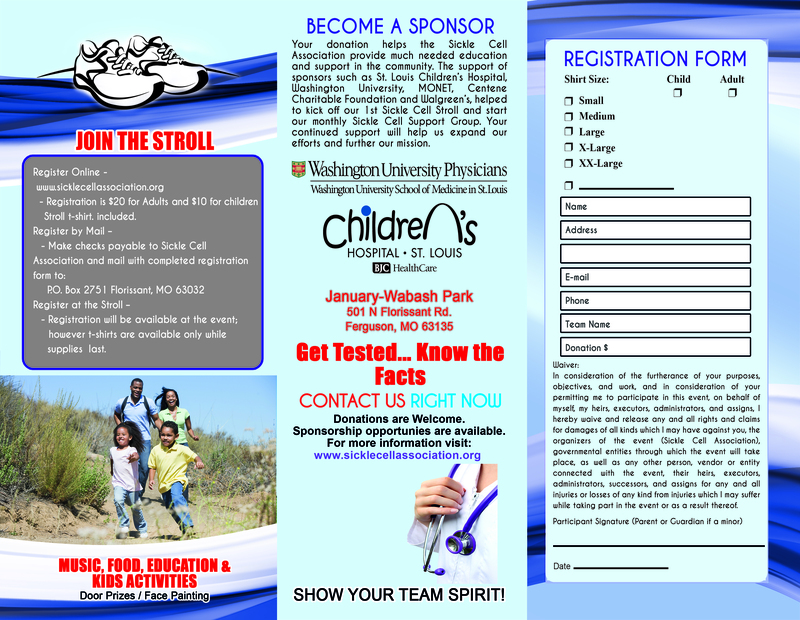 Click here to download the Stroll Sponsorship Agreement form.